Though we're only one week into the fantasy baseball season, we can already draw some conclusions. We don't want to overreact, but we'll give you three guys to add off the waiver wire and three to drop. Though we're only one week into the fantasy baseball season, we can already draw some conclusions. Taking Mike Trout first overall was the right move, as was [avoiding former NL MVP Buster Posey](https://www.betchicago.com/fantasy-baseball-catchers-draft-strategy-sleepers-prospects). Of the three players we told you to add in [this space](https://www.betchicago.com/fantasy-baseball-waiver-wire-add-drop-mlb-opening-weekend) last week, Kolten Wong went 4-for-12 with three runs and two RBIs, Matt Moore injured his knee and might need season-ending surgery but pitched three scoreless innings before he went down, and Pat Neshek tossed two scoreless innings. Of the three we told you to drop, Posey went 3-for-10 but has only two extra-base hits this season and no homers, Rick Porcello was blown up in another start (seven runs in four innings in Arizona), and in an outing against the Nats, David Robertson faced four batters, allowed one hit and walked three, including the winning run. Here are three guys you should add and three you should drop before Week 2 of the fantasy season. (Reminder: I'll suggest adds only for guys rostered in less than 50 percent of Yahoo leagues and drops for guys rostered in more than 50 percent.) __MORE:__ [Optimism for the 2-7 Cubs](https://www.betchicago.com/evaluating-cubs-schedule-winning-streak) | [First manager fired odds](https://www.betchicago.com/mlb-first-manager-fired-odds-dave-martinez-rick-renteria-joe-maddon) ## Fantasy baseball adds __OF Kevin Kiermaier, Rays (rostered in 15 percent of leagues as of Monday morning):__ His production is not sustainable since he had a .653 OPS just last season, and he's known more for his defensive prowess than a power bat. And he's always a candidate for stint on the injured list. But ride him while he's hot. 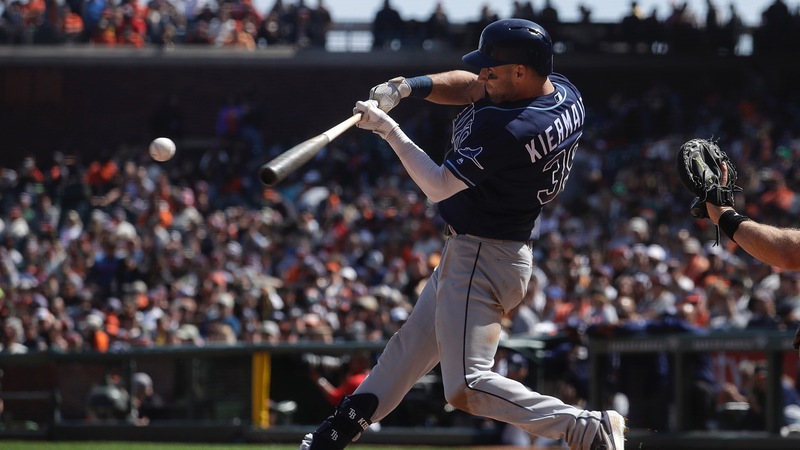 He went 7-for-21 last week with two doubles, a triple, two homers, five RBIs and two steals, as the Rays are off to a 7-3 start. Honorable mention here for the Yankees' Clint Frazier, rostered in only 18 percent of leagues, who had three homers and seven RBIs this weekend in Baltimore. <a href="https://www.youtube.com/watch?v=P2fhsm5Id9c" class="embedly-card" data-card-width="100%" data-card-controls="0">Embedded content: https://www.youtube.com/watch?v=P2fhsm5Id9c</a> __Starter Yonny Chirinos, Rays (36 percent):__ They've got something cooking down there in Tampa (St. Petersburg, technically, but I digress). The 25-year-old has allowed only one run in 12 innings (a solo homer to Jake Marisnick) and has struck out 11 and walked only one. He gets another cushy start this week against the Blue Jays. Keep in mind, he's also eligible as a reliever in Yahoo leagues. __Reliever Diego Castillo, Rays (21 percent)__: Sensing a theme here? I like what the Rays are doing this year, and that includes Castillo, the Josh Hader of the Tampa bullpen (in that he frequently pitches more than one inning). Jose Alvarado is the closer -- and a darn good one -- but if your league has holds as a category, try Castillo, who's allowed only two hits and a walk in seven scoreless innings with seven strikeouts. He has three holds and a save and Alvarado has four saves. ## Fantasy baseball drops __2B Rougned Odor, Rangers (81 percent):__ He had 30-homer seasons in 2016 and '17, but he has only two extra-base hits (both doubles) in 10 games this season and has been caught stealing twice in two attempts. Always a low on-base percentage guy, Odor's OPS so far is .449 with 14 strikeouts in 42 plate appearances. Second base is a thin position, but even a guy like Ben Zobrist (rostered in only 11 percent of leagues) is a better hitter and also position-eligible in the outfield. __Starter Zack Wheeler, Mets (92 percent):__ This one could come back to bite me because he's got talent, he's playing for a contract and he still has strikeout stuff (nine Ks in 9 2/3 innings). But he's also allowed 10 runs with a 1.86 WHIP. His control has been an issue his entire career (3.6 walks per nine), and he threw only 51 of 103 pitches for strikes in Sunday's loss to the Nats. __Reliever Andrew Miller, Cardinals (70 percent)__: He's a guy we mentioned last week, and things haven't gotten much better, as he allowed two homers Saturday in a loss to the Padres. Mike Shildt keeps giving him opportunities and he's only pitched 3 2/3 innings so far, but a guy like Craig Stammen of the Padres (owned in only 12 percent of leagues) should give you better production over the long haul. __PLAY:__ Our [$1,000 Northside Challenge](https://betchicago.chalkline.com/games/chc-opener). Correctly answer six props for Monday's Cubs home opener against the Pirates for a chance at the cash.